Set far back from the road and screened by gorgeous specimen plantings for privacy, this home offers classic, old world construction and charm yet features new world amenities. A sparkling pool, patio, and open rear lawn are enclosed by estate style fencing, and the front yard is pre-wired for electronic gates. The long driveway has a Belgian block accents & leads to an attached 2-car garage plus a gracious parking courtyard with ample space for visitors. This area is embraced by a masonry wall with statuary, specimen plantings, landscape lighting, & custom iron railings which match the original gate. This 4,463 s.f. 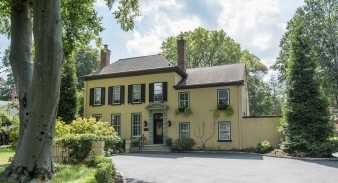 home is located in sought-after Lower Merion school district near Villanova Univ., Ashbridge Park/playground, & the soon-to-open Stoneleigh Estate public garden. Convenient access to Center City, hospitals, corporate centers, Airport, train, and shops, restaurants, and movies in the charming villages of Wayne & Bryn Mawr. Other upgrades incl. new paint, refinished wood floors, energy efficient lighting, ceiling fans, storm water management, new gutters/downspouts, and a multi-room built-in sound system.